Since range is based on only two observations, it is not regarded as an ideal measure of dispersion. A better measure of dispersion is provided by mean- deviation which, unlike range, is based on all the observations. For a given set of observation, mean-deviation is defined as the arithmetic mean of the absolute deviations of the observations from an appropriate measure of central tendency. In most cases we take A as mean or median and accordingly, we get mean-deviation about mean or mean deviation about median. Mean-deviation takes its minimum value when the deviations are taken from the median. 1) Mean-deviation takes its minimum value when the deviations are taken from the median. 4) It is based on all the observations and not much affected by sampling fluctuations. 6) Furthermore, unlike SD, mean-deviation does not possess mathematical properties. 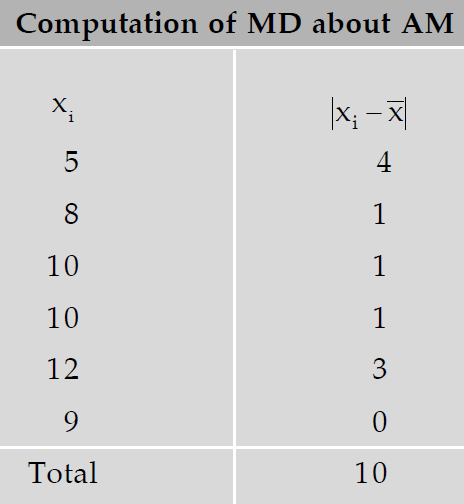 What is the mean-deviation about mean for the following numbers? 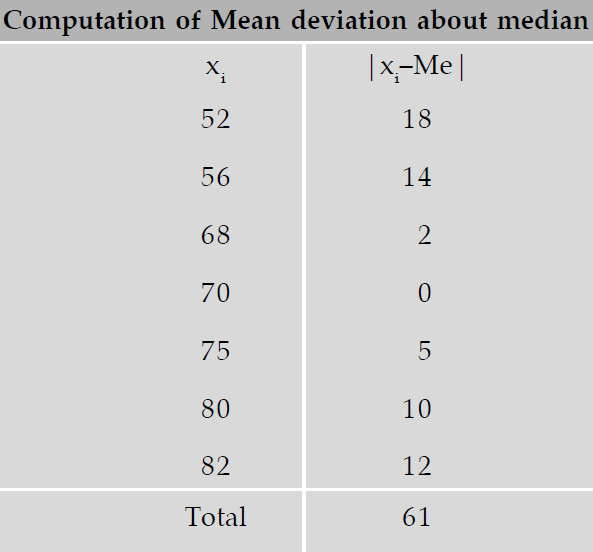 Find mean-deviation about median and also the corresponding coefficient for the following observations. The given observations are in ascending order. After having gone through the stuff given above, we hope that the students would have understood "Mean-deviation".